Ranch manager John Ziegman maintains that Buffalo Creek Ranch in North Park of Jackson County is one of the most beautiful places on earth. 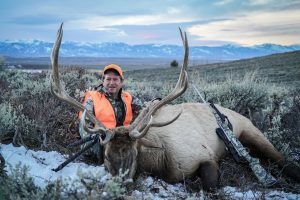 With four to six guides and a two-to-one client-to-guide ratio, Buffalo Creek hosts up to 35 hunters a year, divided into about five archery hunters and 30 rifle. 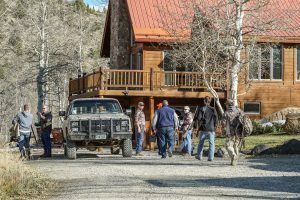 The most at any one time, says Ziegman, is eight, all of whom stay in the ranch’s well-appointed, six-bedroom lodge. It’s these guides, as well as the terrain, which keeps guests coming back. They’re all local, live on the ranch and know the area better than anyone. “They’re the main reason people have such a great experience here,” says Ziegman. Another key, adds Ziegman, is that it’s a working cattle ranch, which fosters great wildlife habitat. Owned for more than 20 years by the MacLeod family from Michigan, which has strived to improve the ranch’s Western heritage, the 20,000-acre ranch harbors evidence of early settlers everywhere — including log cabins, antique equipment and water ditches. 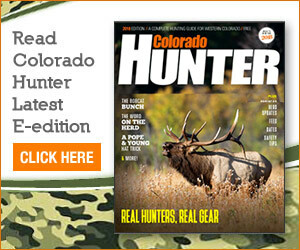 Hunters find reminders of the area’s early pioneers at such landmarks as Chambers Meadow, House Reservoir, Ridings Field, Friends Draw, the Slack Ditch, Brennan Pasture and Whiskey Bill’s Draw. 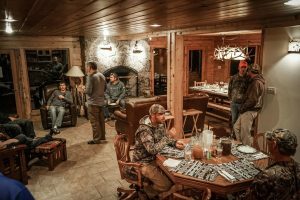 At the end of the day, hunters return to such meals as steak, prime rib, barbecue, smoked meats and more, as well as the cozy confines of the lodge to tell their tales and rest up for the next day.